All the facts on (organic, of course) no dig garden materials. Did I really write ALL the facts? When it comes to facts, gardeners can be a right contrary lot, especially to do with gumboot design, trowel handles AND, all the different STUFF we can put in and on our soil. Tell a gardener that this manure is better than that manure; or see how well this grows with that mulch... and likely as not the reply would be — as a Scotsman would say, "I hae me doots." Despite facts and figures about such subjects as acid/alkaline, minerals and so on, it still comes down to individual applications and environments whereby we will all get slightly different outcomes... sigh. There are relentless performers like good old leaf mulch; and there are the serendipitous discoveries; topped off with occasional failures — or shall we say temporary challenges. Lovely stuff! George from Paremata NZ, collecting some of nature's abundance. Read on for how, what, where and why to use Garden Materials, or skip to. . . . Many years ago, the earth was naturally covered with the flora and fauna to suit conditions. As trees and other plants and animals died they slowly recycled to make more trees, plants and animals. Time didn't matter, and natural disasters just meant plants and animals evolved and adapted to cope. Our little household gardens can't wait for a tree to fall or a wildebeest to stagger in, so WE have to provide the conditions and nutrients in a way that plants can quickly benefit from. Firstly a bit about carbon and nitrogen... or the story of the browns and the greens. . . . The materials used in a no dig garden follow similar principles to those of the garden compost. That is they work best when alternating carbon (brown) layers and nitrogen (green) layers. On the Starting a Garden page, we start with newspaper (brown), lucerne (green/brown), animal manure or fertilizer (mixed brown and green), straw (brown), fertilizer or animal manure (mixed), compost, mulch (may be brown or green). All organic materials contain carbon and nitrogen in different ratios. Higher in carbon brown materials are generally things that are dry and dead. Paper, autumn leaves, sawdust, wood chips and straw. They need some moisture added to help them compost (or can be used to soak up excess moisture by being mixed with greens). Greens are often moist organic material like fresh grass clippings, kitchen scraps, weeds, alfalfa/lucerne and animal manures. The brown materials, as well as providing carbon to assist with the chemical interactions of the nitrogen plants, tend to be bulkier and assist in keeping the garden aerated. No air = smells! The greens can occasionally 'mat', particularly grass clippings and cause a problem with aeration. Some garden stuff like used coffee grounds are green if very sloppy and brown if dried. Seaweed likewise. Some greens are brown coloured, such as rotten fruit and manures; and some browns are green coloured, such as flax and branches. And to top it all off, the ratio of protein and fibre and a host of other components in garden materials also play a part in how well everything decays and the quality of the final result. You'll need a degree to understand it all, but let's go with the basics of what's worked for others should work for you... notwithstanding you might hae yoo doots! "Rug-up, say mothers, Keep warm." Well put a blanket on your garden too... blankets of mulch to keep your plants toes toasty! 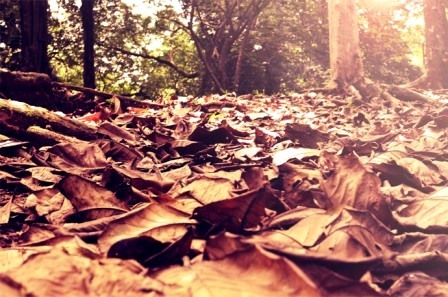 Fall or autumn is traditionally the time to pile up the mulch and fill up the compost. The harvests are over, so there are stalks, leaves, clippings and nature's dried and used leftovers to gather and turn into food and protection for next season's crops. Roughly a hand depth of whatever organic material is handy for you to use or buy. Many materials are free, some requiring a bit of work or travel. So what does garden mulch do? — keeps in warmth; retains moisture; holds plants and roots steady against wind and rain; keeps weeds under control; rots to feed plants; improves soil structure by helping break up clay soils and bulking up sandy soils; stops soil compaction; prevents soil erosion and dust; makes a great canopy to encourage worms and other beneficial life. What about green mulch? — Many seeds will happily germinate and grow blithely through cold weather. By growing these plants en masse in your garden, they provide a green mulch, sometimes called a cover or fallow crop. Popular plants are mustard, lupins, legumes, barley, rye etc. These cover crops protect the soil and can be forked in or just squashed down in late winter/early spring under some no dig layers, like paper and compost. These green cover crops provide ideal nitrogen to give your garden a boost for the new season. Leaf Mulch and Leaf Mould — Click to open new page. 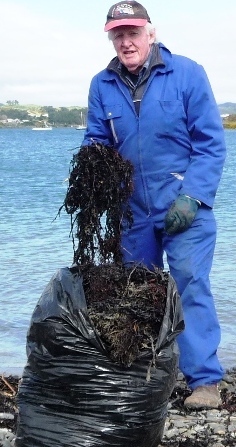 Seaweed Fertilizer — Click to open new page. Use only ash from non-preservative treated wood. Wood ash provides potassium carbonate (potash) which enriches poor soils and helps them retain water, amongst other benefits. Sprinkle a big handful per square metre over your garden several times a year. Wood ash also contains calcium carbonate, which is often used instead of lime to increases soil alkalinity. So although potassium is an essential element needed by plants, because of the calcium carbonate in wood ash, don't overdo it on acid loving plants. Mixing wood ash with other materials such as manure and straw helps provide nitrogen, and bulk to stop matting. After a while, once wood ash has been exposed to rain and the weather in general, the nutrients have been leached out and the alkaline content has lost a lot of its potency. Palm and coconut husks are broken into smaller bits and sold as mulch. They provide good cover and break down faster than most wood and bark chips. Cacao bean shells or husks have a lovely smell and are lovely for the garden. They are the by-product of chocolate manufacture, and unfortunately dogs, like us, can take a liking to choccy too. Dogs can suffer from methylxanthine toxicosis if they eat chocolate or cocoa bean shells, which causes vomiting, muscle spasms and is occasionally life-threatening. So don't use if you have nearby dogs. If you think mushroom compost is going to give your plants some snap and sizzle, it won't exactly... but it will give your soil a conditioning boost. It's called spent mushroom compost really, because like after running a marathon, one is spent, tuckered out, had it (I know). So mushroom compost has had it too. It's an excellent soil conditioner/soil amendment, bulking sandy soils and aerating clay soils, because of the straw and other carbon content, but the chicken or horse manure and other nutrients originally mixed with the straw have been depleted by the one to three mushroom crops grown in it. The high organic matter of mushroom compost in the way of mostly straw will supply nutrients slowly to the soil over time, but unless it's fresh and has only been used for one mushroom crop, it will not usually be sufficient to fertilise your current season's plants. Make sure you get organic mushroom compost with no added artificial fertilisers, or additives such as wetting agents. Because the warm and moist environment of mushroom growing can produce fungal problems, flies, midges and gnats, then non-organic growers will resort to chemical pesticides. So always double check you are getting an organic supply, in fact check to see that its certified organic. As it has been heat sterilized, mushroom compost is weed free although unfortunately lacking in soil microbes. But because of its crumbly light composition, worms and other beneficial organisms will soon populate it. Mix it with compost or put about a 3cm (1 inch) thick layer straight onto your garden. The current research, seems to favour the fact that this compost does not have high enough soluble salts, especially sodium, to damage plants. Trials have shown a good balance of minerals and no purpose is served by further treating or leaching. Fresh or aged from stockpiles, mushroom compost should have a pH of 6-7 which is useful for most plants. Untreated sawdust from sawmills and woodworkers/carpenters that use native woods are all good for the garden. Woodchips, either your own chipped prunings or from an arborist, as well as bark from garden suppliers, all can go on your garden and also pathways. All these materials are excellent for suppressing and deterring weeds, but they are high in carbon, and some take a while to rot down and can rob your soil of nitrogen as they do. Before adding to your garden it's best to leave sawdust, chips and bark to mature for a good few months if possible. Mixing it with a layer of sheep, aged chicken or horse manure works well to speed decay and balance the soil, especially if you do add the sawdust and woods fresh onto your garden. Sawdust: Untreated sawdust is good to use and will rot fairly quickly over a year. Adding a nitrogen fertiliser will help stop nitrogen depletion. If you put some newspaper layers down first then that will help and will slow down the decomposition of the sawdust. Sawdust tends to mat, which will block air and water, so depending on how fine or coarse the sawdust is, don't put down too thick a layer. Bark: Popular for mulching are shredded red cedar and redwood bark in the US. These mulches should not be put near houses as they can ignite easily because of their light, fibrous and spongy nature (sparks, wildfires etc). There are similar varieties in other countries, so always check how safe bark mulches are before using. Bark mulch looks good, but takes ages to rot and thus will take many years before you can expect it to provide any nutrients back into your garden. Woodchips: Brilliant for mulching and for releasing nutrients and conditioning your soil over 1-2 years. Woodchips that contain both mulched branches and leaves are the best as they provide nitrogen and carbon. Very long lasting mulch! The basis of soil started with rocks, so I guess if you wait a millennium or two, the weather will have broken down your rocks to sand and clay. Interestingly, in hot lands with sparse vegetation, light white, grey and cream coloured stones are piled around precious plants for temperature control. These stones reflect the sun's rays from the ground and plants' roots. They also absorb some heat to release it back during night when temperatures in desert regions often plummet. Like all mulches, even stones will hinder evaporation and help the soil retain what moisture it has. Lucerne hay (when still green is usually called alfalfa) is supreme, with pea straw supremo no 2. Both are a joy to handle, being light and fine, thus pokable around plants. A couple of bales or large bags will do most smallish to medium gardens. Watch the wind and birds don't scatter it asunder, and watch out for stray seeds and weeds. Of course any pea shoots that appear can be eaten or carefully transplanted to other garden locations to grow on. As well as garden centres to buy mulch — not cheap unfortunately, hay and alfalfa in particular can be obtained from stables, race tracks or farms. Often it's free if bales have been ruined by weather and not good quality for horse or animal feed. Read Hay or Straw bale Gardening for more about the different qualities and use of hay and straw and similar hanger-ons. There is much flotsam and jetsam... or odds and ends that are found on the ground, flutter, whirl or crash to the ground for us to use in and on top of the garden. Pine cones, seed husks, twiggy bits and pieces, moss, shells, pumice, vermiculite and so on. In our homes and workplaces, we also produce, or rather, discard organic stuff that can be used for the garden. Apart from kitchen scraps for composting, there are often larger piles of goodies that make perfectly good mulch, such as nut shells like pistachios and walnuts; old corn stalks and cobs cut up or put through mulcher machine; shredded paper; spent hops from breweries, and more.